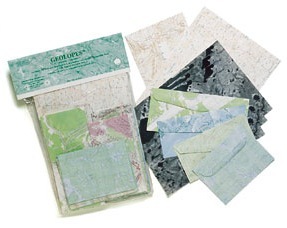 Geolopes are common sized envelopes and stationery recycled from outdated government surplus topographic maps published by various U.S. and Canadian government mapping agencies. This is the perfect three R's green product for the next century --Reduce, Reuse, Recycle. They make excellent gifts for the geomanics on your list or just use them for yourself. Your correspondents will definitely want to tear open their mail when they get one of these fascinating envelopes in the letterbox. There is no telling what geographic areas of North America will appear in your assortment -- mountains, forests, lakes, rivers, cities -- who knows? We offer some pre-packed gift options as well as discount priced bulk sizes. To check out our Geolopes selection click here. Dimensions (in inches): 8.5 x 5. New England Cartographics; ISBN: 1889787116; Dimensions (in inches): 6" x 9"
New England Cartographics; ISBN: 1889787124; Dimensions (in inches): 5.5" x 8.5 "
New England Cartographics; ISBN: 1889787094; Dimensions (in inches): 6" x 9"
Join the N.E. Cartographics mailing list and learn about our specials and new publications.